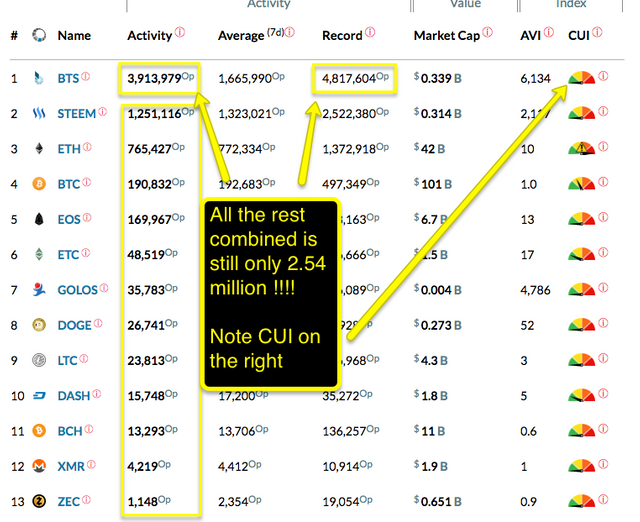 29 Jun BitShares grabs all-time blockchain activity record! Root cause of the unusually large volume of activity in the past days was in fact found to be an accidental global stress test. One of the active block producers (witnesses) had made a private investment and a sprint to fully test the limits of their own setup, by publishing a bleeding edge amount of price feeds. This ended up in millions of operations being made. By the time you read this, the testing will likely have come to an end. Even so, this unexpected little test didn’t even push the blockchain utilization capacity out from the green reading! Oh – and if you add up all operations from all on the rest, BitShares processed more than all of them added together in the past 24 hours!